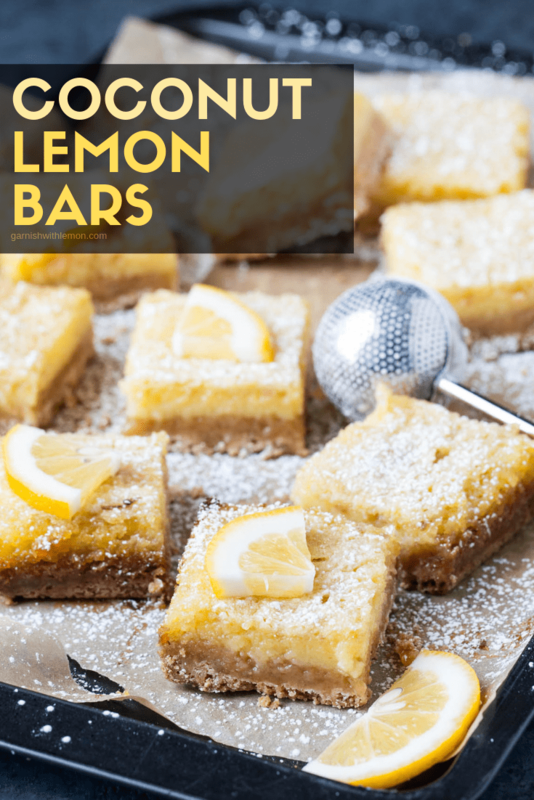 This delicious recipe for Coconut Lemon Bars is bursting with bright citrus flavors and just a hint of the tropics in the coconut shortbread crust. These Coconut Lemon Bars deliver on the fresh flavors we’re all craving this time of year. Light and bright with the perfect sweet-tart pucker, our Coconut Lemon Bars add a tropical flair to the traditional lemon bar recipe. Are you a lemon lover like me? Well then these Coconut Lemon Bars are for you! Filled with a half cup of freshly squeezed lemon juice and a full two tablespoons of lemon zest, you definitely get a beautiful balance of tang and sweetness in every bite. A healthy addition of toasted coconut gives the sturdy shortbread crust just a bit of chew. Though I could eat the coconut shortbread crust on its own (new recipe, perhaps? ), it’s the marriage of the crust and the lemon filling that make these Coconut Lemon Bars stand out from other lemon bar recipes. I have leftover lemon juice from this Coconut Lemon Bars recipe. Can I freeze the leftover juice? Yes! I sometimes need to zest an extra lemon to get the right amount of zest for this recipe, but I don’t need the juice from the zested lemon. What to do? Squeeze that zested lemon, pour the juice into ice cube molds and freeze for the next time you need a few tablespoons of fresh juice for a recipe! 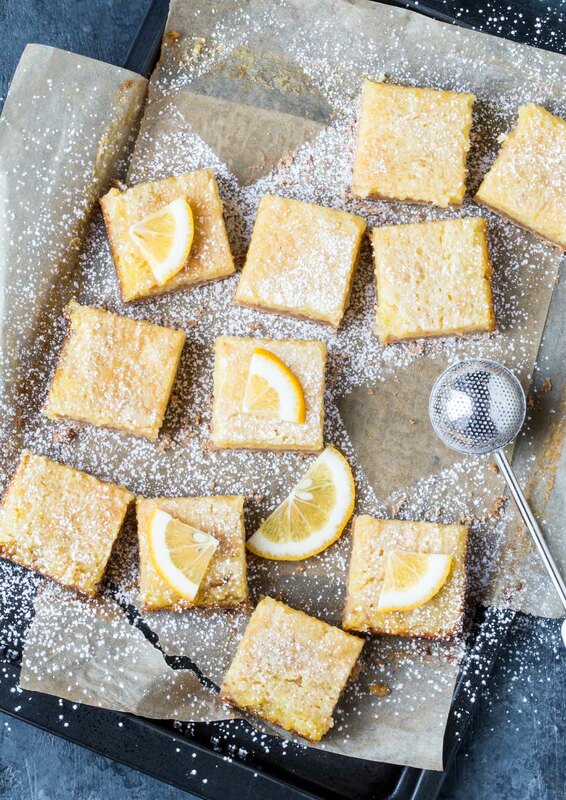 Can I adapt this recipe for Coconut Lemon Bars to make them gluten-free? Absolutely! Yes! Simply swap in the all-purpose flour called for in the recipe with the gluten-free flour of your choice. I’ve had great success with the Cup 4 Cup brand. Spring is filled with all sorts of reasons to make these Coconut Lemon Bars. On our calendar alone, there is a wedding shower, baptism, a graduation and, of course, Mother’s Day. 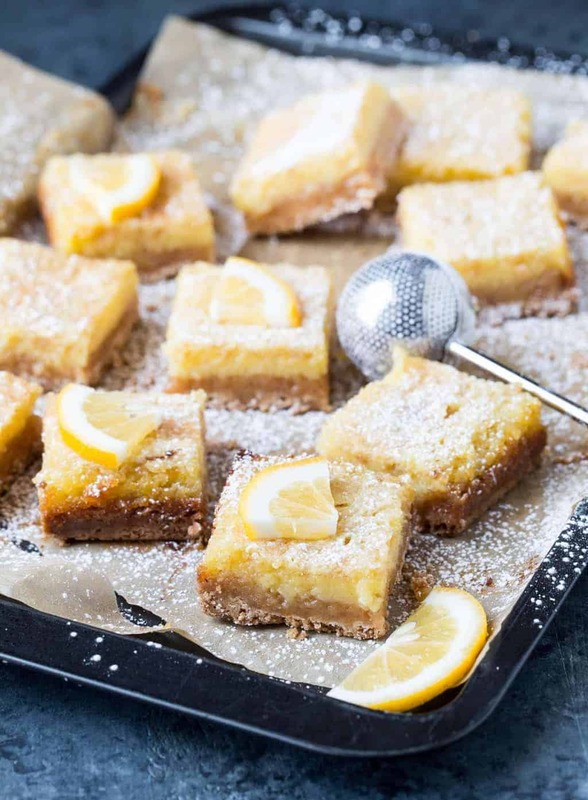 Pick any occasion (or none at all) to whip up a pan of these Coconut Lemon Bars. They are the perfect spring dessert for everyone. Give in to your cheesecake craving with a pan of these easy Lemon Cheesecake Bars. Love the addition of berries in this Raspberry Lemon Bar recipe! Not exactly a lemon bar, but we still adore the bright, citrus flavors in this Greek Yogurt Lemon Poppy Seed Bread. These Lemon Bar Cookie Cups perfect bite-sized treats for any party. Preheat oven to 350 degrees. Line an 8 x 8 pan with enough parchment paper so that there is some overlap on the sides (to help lift the bars out of the pan later). Spray paper with cooking spray. Set aside. Spread coconut on a sheet pan and bake until golden brown, shaking the pan every few minutes as needed. This should take about 10 minutes. Allow coconut to cool. Place flour, sugar and salt in the bowl of a food processor and pulse to combine. Add coconut and butter and process until the mixture resembles a fine meal. Pour into pan and press crust into even layer. Bake for 25 minutes or until crust is starting to turn golden brown. While the crust is baking, place all filling ingredients into the bowl of a food processor and mix thoroughly. Take crust out of oven and pour filling over hot crust. Return to oven and bake for another 25-30 minutes or until the center starts to spring back when touched. You may have to tent with foil about halfway through the baking time if the top of your bars is browning faster than you'd like. Remove from oven and cool on wire rack. Cover and refrigerate for at least 3 hours. When ready to serve, lift parchment from the pan and cut bars. Sift powdered sugar over bars, if desired. I have made this recipe with gluten-free flour, and the results were also delicious. Yay, so glad you liked them! I love a good classic lemon bar, but the addition of coconut is a tasty twist.